At GECA, our vision is for a sustainable future for people and planet. We recognise that achieving this requires us to support positive and realistic continuous improvement, whilst creating solutions for sustainable consumption and production. We created the Reusable Plastic Bags standard (RPBv1.0-2018) as a starting-point to empower manufacturers, retailers and consumers to transition away from single-use plastic bags toward options that are GOOD for people and planet. Currently, vast numbers of Australian consumers use disposable bags for carrying their shopping, with over 7 billion single-use plastic bags in circulation each year. Many of these plastic bags are made from petroleum and natural gas, which are non-renewable resources. Some are also made from coal and cellulose. Plastic bags contribute to a wide range of serious environmental impacts, such as pollution of our waterways, littering our green spaces and depleting resources during their manufacture. Furthermore, single-use plastics have been accumulating in the environment with terrible consequences for wildlife and their habitats. Marine animals are particularly vulnerable to being caught in plastic debris and can mistake light-weight bags for food sources such as jellyfish. One survey found 70% of dead loggerhead turtles in Moreton Bay, South-East Queensland, had eaten plastic. Plastic bags have also been known to smother coral and other seabed communities. Ideally, we see a future without plastic bags of any kind, however we’re not there yet. We’re thrilled to see Australia moving closer to this future with single-use lightweight plastic bag bans currently either implemented or pending in all Australian states and territories, except for NSW. While more and more consumers are getting comfortable with bringing their non-plastic reusable bags from home when they go shopping, the reality is that many people will still opt to buy reusable plastic bags in-store. According to Planet Ark, over 200,000 single-use plastic checkout bags are dumped in landfills every hour. This is where our Reusable Plastic Bags standard comes in. At GECA, we decided that if significant numbers of people are going to be using reusable plastic bags, then it was vital that this option was made as sustainable and ethical as possible. We wanted consumers to be able to purchase a bag with a high quantity (minimum 80%) of recycled content, that was also recyclable. Progress in the plastics industry has allowed for the development of recycling systems with a comparatively lower level of environmental load compared to virgin materials. Importantly, bags created using recycled plastic products have appropriate strength and performance characteristics making them suitable for their intended purpose. We have created this standard to define environmental performance criteria for reusable plastic bags. 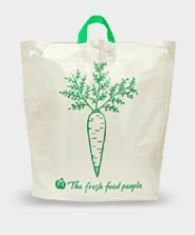 Reusable plastic bags are environmentally preferable because they reduce demand for virgin plastic materials and reduce the amount of waste going to landfill, thus relieving the environmental burdens. By being reusable and recyclable, we hope to also reduce the impact on wildlife and their habitats. From a lifecycle approach, bags certified under this standard are the best option for a reusable plastic bag and far better than single-use bags – when they are properly reused as much as possible and eventually recycled. Woolworths’ reusable bags are the first to be certified under GECA’s standard, meaning that more than 3.2 billion single-use plastic bags will be removed from circulation every year. Check for the GECA Ecolabel on the base of the bag to ensure it has been certified under our standard. Click here to read Woolworth’s full 2018 Sustainability Report. With our commitment to continuous improvement, we hope that our Reusable Plastic Bags standard will be superseded in the future by an even better alternative. We also fully acknowledge and advocate for consumers to bring their own reusable bags from home as the preferred option to relying on our reusable plastic bags. If you do purchase one of our GECA certified reusable plastics bags, please help us to do GOOD for the environment by reusing your bag as much as possible and then ensuring it is recycled appropriately when it can no longer serve its purpose. If you have any questions, please contact us on 0422 873 316. No matches were found - please try searching our full product database.